The Ploce-Trpanj car ferry takes one hour and connects Ploce, on the mainland with Trpanj on the Peljesac peninsula. You mean you don't want to stay in Trpanj? Fine. 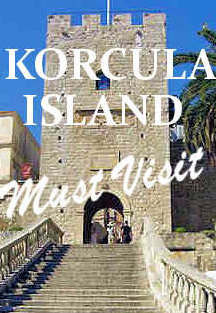 Drive a few kilometres to Orebic where you can take the Orebic-Domince ferry to Korcula Island. The Ploce-Trpanj car ferry shuttle is run by Jadrolinija.You can buy tickets online at the Jadrolinija website, at any Jadrolinija office or go to the port at least 1/2 hour in advance, buy your ticket at a stall and put your car in the waiting line. Buying tickets in advance does not mean you don't have to wait in line. New! 2018 Croatia Ferry Schedules! Here we are at the beginning of a new year and with a new set of ferry schedules governing trips from the coast to Croatia’s best islands. 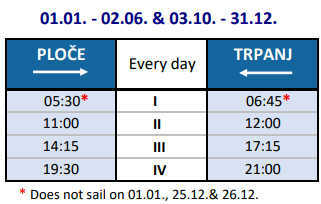 As usual, Jadrolinija, Croatia’s state ferry line, is first off the mark with a complete package of car ferry schedules. Only Jadrolinija handles car ferries and the company’s schedules change little from year to year. Passenger ferry schedules are much more fluid as Jadrolinija and other companies adjust to the seasonal flux of visitors. Many of the passenger ferries are summer only and most do not see their schedules finalized until the spring. … Continue reading → More. Day trips from Split to Croatia's most beautiful islands are now easier than ever. A brand new passenger ferry service is scheduled to start in mid-June and run until mid-September. More. Krilo company just confirmed that the popular Split-Milna-Hvar-Korcula-Hvar-Mljet passenger ferry will start on More.